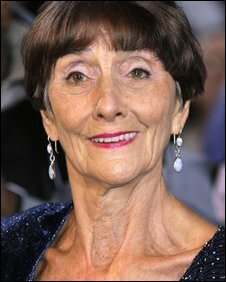 EastEnders actress June Brown, who achieved fame as chain-smoking Dot Cotton, has been appointed MBE in the Queen's Birthday Honours for services to drama and charity. The 81-year-old is one of the BBC soap's longest-running characters and has become a firm favourite with viewers. Like her on-screen persona, Brown's private life has seen its fair share of tragedy. She was born in Suffolk in 1927 to a wealthy father who went bust after investing money in German banks before World War II. Her younger brother, John, died of pneumonia in 1932 aged just 15 days, and two years later she lost her elder sister, Marise, who was eight. Brown served in the Women's Royal Naval Service at the end of the war before leaving to train at London's Old Vic Theatre School. There she met and married her first husband, actor John Garley, in 1950, but he suffered depression and gassed himself to death at home in 1957. A year later, she married actor Robert Arnold who starred in the BBC series Dixon Of Dock Green. The couple shared 45 years of marriage, before Arnold died of pneumonia in 2003. They had six children together, although her second daughter Chloe, born prematurely at 28 weeks, died after just 16 days. 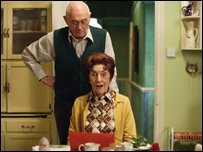 When Dot Cotton arrived in Albert Square in 1985, Brown was in her late 50s. Actor Leslie Grantham, who played Dirty Den, suggested her for the role. Until then, Brown's career had incorporated stage, film and television, with appearances in Coronation Street and Doctor Who. But the character of Dot was to make the actress a star. Dot's lot was largely an unhappy one - always guided by the scriptures, she tried in vain to put her good-for-nothing son, Nick, on the right track. 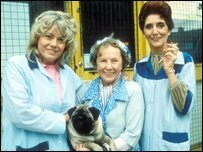 After a four year break from the soap between 1993 and 1997, Dot returned to the Square and suffered more torment, helping her best friend Ethel to end her life in a controversial storyline in 2000. Sparring with her on-screen husband Jim, whom Dot married in 2002, provided some lighter moments and when Dot was stuck for words, her response was the inevitable: "Ooh I say!" Earlier this year, the actress became the first actor in a British soap to carry an entire episode alone, with an emotional monologue dictated to a cassette for her screen husband to listen to in hospital following a stroke. Brown's honour also recognises her work as president of the Michael Elliott Trust, which gives children with special needs the chance to care for abandoned donkeys. The actress told The Times in 1997 "I am never going to be made a Dame doing Dot", but it seems she is well on her way.